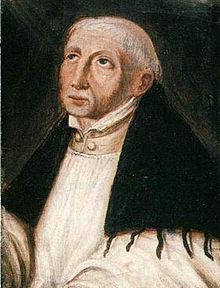 John van Ruysbroeck (1293-1381) was a Flemish mystic and writer. He was raised in the Catholic faith, becoming a priest. He is now venerated in the Catholic Church. He was beatified in 1903 by Pope Pius X. When love has carried us above all things, into the Divine Dark, we receive in peace the Incomprehensible Light, enfolding us and penetrating us. What is this Light, if it be not a contemplation of the Infinite, and an intuition of Eternity? We behold that which we are, and we are that which we behold; because our being, without losing anything of its own personality, is united with the Divine Truth. If we would taste God, and feel in ourselves Eternal Life above all things, We must go forth into God with a faith that is far above our reason, And there dwell, simple, idle, without image, Lifted up by love into the Unwalled Bareness of our intelligence. For when we go out from ourselves in love, and die to all observances in ignorance and darkness, Then we are made complete, And transfigured by the Eternal Word, Image of the Father. And in this emptiness of spirit we receive the Incomprehensible Light, Which enfolds and penetrates us as air is penetrated by the light of the sun; And this Light is nought else but a fathomless gazing and seeing. What we are, that we gaze at; and what we gaze at, that we are. For our thought, our life, our being, are lifted up in simplicity, And united with the Truth, that is God. Therefore in this simple gazing we are one life and one spirit with God—And this I call the seeing life. …he must have lost himself in a waylessness and in a darkness in which all contemplatives wander around in enjoyment and can no longer find themselves in a creaturely way. In the abyss of this darkness in which the loving spirit has died to itself, there begin the revelation of God and eternal life. For in this darkness there shines and is born an incomprehensible light which is the Son of God, in whom one contemplates eternal life. And in this light one becomes seeing. If you would like to submit a “First Vision” account, either personal or found, for inclusion on this website, please click here. I have given you this content as a free gift. I invite you to also give, to participate in this gift economy, to support this work. You may do so by debit or credit card by entering an amount and clicking the blue button below. For other ways of giving, please reach out to me. Many thanks for your kind generosity and the gift which makes this all possible! May you have peace and every good.